ESA’s spacecraft Rosetta has unveiled important data about the water-cycle of comet 67P Churyumov-Gerasimenko after studying its nucleus for the past year, according to a press release made by the ESA. The comet was discovered in 1969 by Klim Ivanovych Churyumov of the Kiev University’s Astronomical Observatory. It is known that comets are small solar system bodies made from ices, dust and rock. The nucleus can contain water, methane, nitrogen, among other ice. “As sunlight heats the frozen nucleus of a comet, the ice in it – mainly water but also other ‘volatiles’ such as carbon monoxide and carbon dioxide – turns directly into a gas. This gas flows away from the comet, carrying dust particles along. Together, gas and dust build up the bright halo and tails that are characteristic of comets”, says the press release from the ESA. Analyzing data from the spacecraft, measured with an instrument called the Visible and Infrared Thermal Imaging Spectrometer, the scientists found that the 67P comet has a part of the surface covered with a layer of organic compounds, according to PHYS. Researchers have identified “a region on the comet’s surface where water ice appears and disappears in sync with its rotation period”, as it appears on the paper published in the science journal Nature. This could explain the appearance of the organic compounds on the surface that couldn’t be seen previously. “We found a mechanism that replenishes the surface of the comet with fresh ice at every rotation: this keeps the comet ‘alive’,” says Maria Cristina De Sanctis from INAF-IAPS in Rome, Italy, lead author of the study, according to the ESA. “…when the Sun was shining on these regions, the ice was gone. This indicates a cyclical behaviour of water ice during each comet rotation”, says De Sanctis in the press release. 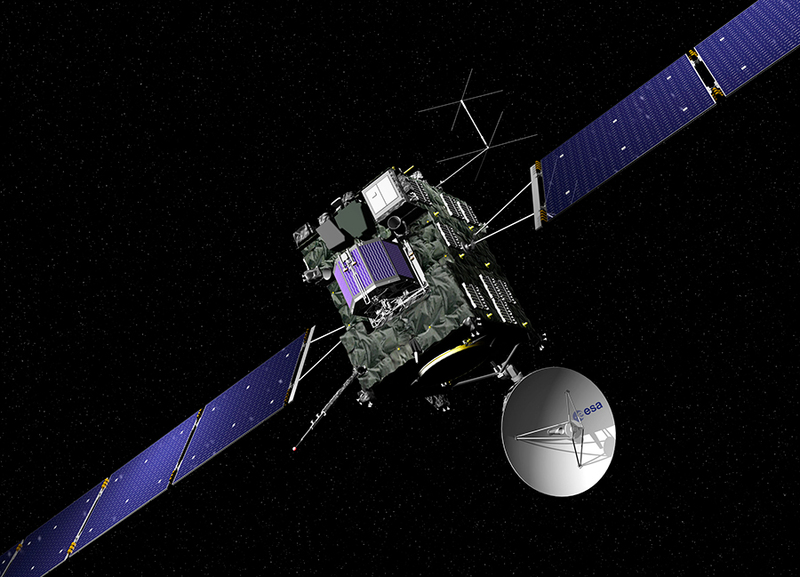 The ESA’s ‘comet chaser’ has been orbiting since March 2004. The Rosetta Mission was approved in November 1993, combining efforts from scientists and engineers from Europe and the United States, as it reads in the ESA website. Now the spacecraft is going to travel to a location closer to the sun, 1500 km away from the nucleus to observe the comet’s behavior near the solar wind. When the comet faces the solar wind, all the gases and dust get flown away, creating its characteristic tale. This closer look will provide information unknown, being the first time a comet is observed from that distance, according to PHYS.